One of the imported turtles that is commonly seen in pet stores and on price lists is the semi-aquatic Reeve's turtle, Chinemys reevesii. This turtle is smaller in overall size than the common sliders and painted turtles, making it very suitable for indoor maintenance. In addition, it tames very rapidly, makes a very hardy captive, and each individual turtle has a distinct personality. For these reasons, it is a turtle that can be recommended to someone who is new to turtle-keeping. The Reeve's turtle comes from mainland China and Japan, where it is found in great abundance in a number of areas. It is also found in Korea, Taiwan and Hong Kong. It usually lives in ponds, streams and canals that are relatively shallow and have muddy or sandy bottoms. Turtles will frequently leave the water to bask on rocks or logs. The Reeve's is not a nocturnal turtle and can be seen foraging for food during the day, much like the sliders and painted turtles common to much of the United States. Two other species of Chinemys exist: Chinemys kwangtungensis and Chinemys megalocephala. Both species are relatively rare, although Chinemys kwangtungensis is occasionally available from dealers. Unlike native semi-aquatic turtles such as sliders or painted turtles, the Reeve's turtle is not saucer-shaped but more rectangular overall. 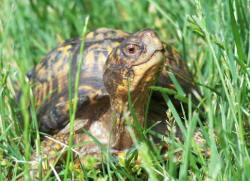 It is one of the smaller turtles available; most animals only grow to about five inches in length. The shell of the Reeve's has three keels, or ridges, running the length of the carapace from head to tail. Coloration of the Reeve's turtle varies widely from individual to individual. The shell can range from a yellowish-brown to a dark brown or black shade, while the skin can range from an olive or grey-green shade to black. In the lighter animals, there are series of white or yellow lines running along the sides of the neck and head. The black animals tend to lack this striping. There are only a couple of features that vary between male and female Reeve's turtles. The first sexual dimorphism is the size and shape of the tail. The male has a longer tail, with a pronounced bulge at its base. As in many male turtles, the vent opening on the tail is beyond the edge of the carapace. The second difference is the presence of a slight concavity in the plastron of the male turtle. This is not very deep however, and is not as good an indicator as the tail differences. In addition to these differences it is possible that the darker, nearly black, turtles are more likely to be male, while the brown and olive green animals are more likely to be female, as the males tend to become more melanistic with age. Certainly, among the numerous Reeve's turtles I have examined, most if not all of the black individuals were male turtles. The Reeve's turtle is an omnivore. In the wild it eats insects, frogs, fish and aquatic plants. In captivity it will take raw liver, steak, beef heart, cooked chicken, lettuce, pear, cantaloupe, earthworms, mealworms, crickets, monkey chow, and the prepared turtle foods such as Tetra's Reptomin. This turtle is quite a voracious eater and will overeat if provided with sufficient food. When eating larger pieces of meat or fruit, it bites down and tears at the food with its front claws until the piece rips apart. If keeping them in an indoor aquarium, I recommend feeding the turtles in a separate container, allowing the mess made by the feeding turtles to be easily disposed of and avoiding excessive fouling of the aquarium water. The turtles quickly become used to being fed in this way and will come over to you to be picked up when it is time for feeding. In captivity the Reeve's turtle can be kept in the same way that one would keep an ordinary slider or painted turtle. It does quite well in either an outdoor pen in which there is a pool for swimming or in an indoor aquarium. If kept indoors, an individual adult turtle does well in a 20 gallon "long" or 30 gallon aquarium, while a pair should be housed in a 30 gallon "long" or a 40 gallon aquarium. More turtles will call for more space, obviously. For example, I keep a pair of Reeve's in a 75 gallon tank with a pair of mud turtles without any problems at all. The Reeve's turtle is quite active and so minimal decoration of the tank is suggested, as they may quickly destroy any plantings. However, be sure to position flat smooth rocks or wood above water under a lamp to provide areas for the turtle to leave the water, dry off, and bask. These turtles are somewhat cold-hardy and will remain active at lower than normal temperatures but this is not an optimal situation for them. I tend to maintain my turtles at approximately 70 to 72 degrees F, slightly higher than room temperature. The Reeve's turtle has a wide variety of behaviors, making it a fascinating animal to observe. For example, a Reeve's owned by Mark Macrae, in Massachusetts, enjoys having its back scratched, even raising its carapace up and moving around so that the appropriate places are scratched. A small Reeve's I own will climb up on any turtle basking under the lamp. If two turtles are basking, the Reeve's will attempt to climb on top of both simultaneously. The turtles also exhibit some interesting behaviors during courtship and mating. For example, one male in my possession continually follows a larger female around underwater, attempting to put his nose in her rear leg holes or bump noses with her. She ignores him most of the time, but occasionally will turn around and lunge at him with mouth agape. He then scuttles backward with his head withdrawn. If she stays facing him, he will then shoot out his head, with mouth agape, and she will quickly withdraw her head. Then she will lunge at him again. They can continue this behavior for minutes on end with neither turtle ever being bitten. I have never actually seen the female give in to the male's advances, so this pattern continues to be repeated periodically. If you do wish to breed your Reeve's turtles, a land area should be included in the set-up so that the female turtle can bury her eggs in the damp sand or dirt. She will usually lay two or three eggs at a time. These can be carefully removed from the land area and incubated at a temperature of 78 to 85 F. Hatching should occur in about 80 days. For a more complete discussion of breeding Reeve's turtles, however, see Elke Zimmerman's book "Breeding Terrarium Animals". 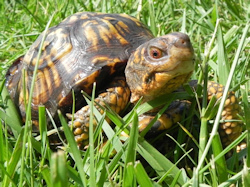 The greatest problem with the Reeve's turtle is the condition of newly imported animals. A large percentage of the turtles that I have examined have had an infection that causes the scutes of the shell to peel up and separate from the underlying tissue. Although not immediately life-threatening, it takes quite a bit of time and effort to eliminate and does detract from the appearance of the animal. One turtle in my possession lost all of the scutes on her plastron. Although the plastron did regenerate the missing scutes, this took two years, and the regenerated scute boundaries were not straight and sharp, but rather were wavy and incomplete. The large number of animals with this problem is probably due to the conditions that they are kept under during importation or during the distribution process to pet shops. Holding large numbers of turtles in one place under less than optimal conditions allows the rapid spread of any infection that a single wild-caught turtle may be harboring. Hopefully the trend towards captive-breeding will reduce this problem, as captive-bred animals are usually free of these types of infections and are usually not shipped and held in mass quantities. I highly recommend the Reeve's turtle to anyone contemplating keeping water turtles. Unlike the native sliders and painted turtles, it does not grow to a large size, and so may be kept in a reasonably-sized aquarium without problems. However, unlike the smaller native species such as mud or musk turtles, the Reeve's is active during the day, making it an easy turtle to observe. It is a very attractive and hardy animal and will eat a large number of food items readily. Finally, each quickly develops a distinct personality, making them wonderful turtles to watch, especially if a male and a female are kept together. In a nutshell, the Reeve's turtle is one of the most easily-kept and fascinating turtles that are currently available. This article copyright 1991 by David T. Kirkpatrick. Originally published in Reptile & Amphibian Magazine, November/December 1991, pages 2-7.